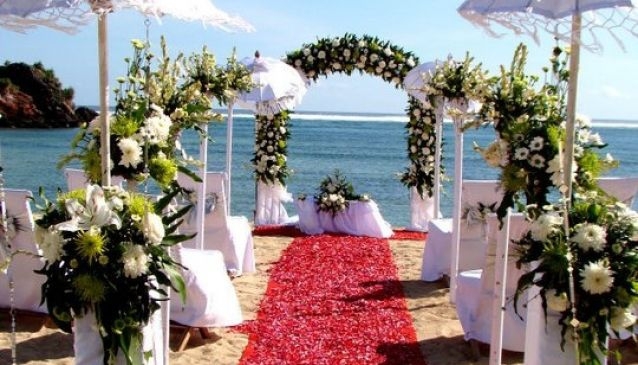 Situated on the southern shore of Lombok island, Novotel is the ideal location for your wedding, with it holding picturesque views of white sandy beaches and the clear azure bay of Kuta beach. This four star hotel guarantees to provide you with your dream wedding, whether it be a small gathering or a large celebration, Novotel's facilities aim to accommodate for all. Set within lush tropical gardens, the resort features traditional Sasak and is situated just 19 kilometres away from Bandara International Lombok Airport, making it easily accessible. The hotel comprises of 102 rooms, suits, Sasak and private pool villas to enable a tranquil and relaxing stay. The hotel has four restaurants and bars, a fitness centre, an outdoor pool, a spa room for massages, table tennis, volleyball facilities and bike hire facilities. It is also nearby a golf course and the beach, allowing you to enjoy some snorkelling, kayaking, scuba diving and much more during your stay. With Novotel's convenient location and an abundance of activities to keep your guests entertained, it is the perfect place for your wedding.